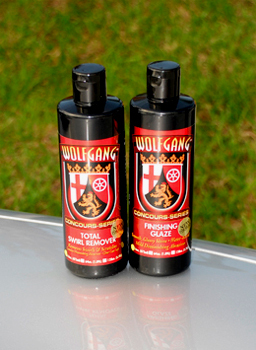 Home > Shop By Brand > Wolfgang Concours-Series Car Care > Wolfgang Finishing Glaze 3.0 32 oz. Maximum gloss enhancement for all types of paint. Wolfgang Finishing Glaze 3.0 is a special gloss enhancing glaze and finishing polish that restores the maximum shine to automotive paint after compounding. Use Wolfgang Finishing Glaze 3.0 on dull paint to revive the deep color and intense shine. Your detail isn't finished until you use Wolfgang Finishing Glaze 3.0. Wolfgang Finishing Glaze 3.0 is gentle enough to use on new OEM paint finishes, yet it is highly effective on hard, ceramic clear coats. The fine, consistently sized abrasives have strength in numbers. The high concentration of microscopic abrasives smooth minor imperfections in ceramic paint and diminish to an ultra fine abrasive dust. Because these abrasives are so small, they will not mar conventional, “softer” clear coats. You’ll get consistently smooth, flawless results every time. Wolfgang Finishing Glaze 3.0 is designed to deliver maximum performance in an easy-to-use formula. The water-based polish is low-dusting, silicone-free, filler-free, and wax-free.Wolfgang’s polishes are developed for auto production so every polish they make is suitable for a body shop environment. Wolfgang Finishing Glaze 3.0 is step 2 of a total paint makeover including Wolfgang Total Swirl Remover 3.0. Wolfgang Finishing Glaze 3.0 fuses Germany's nano polishing technology with Wolfgang's diminishing abrasives. Wolfgang Finishing Glaze 3.0 can be applied with a polisher or by hand. 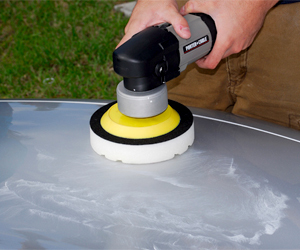 To remove compounding swirls and mild oxidation, we recommend using a polisher. Apply by hand for shine enhancement. 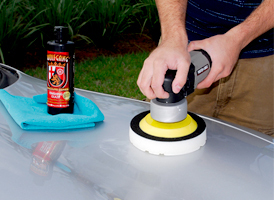 Use Wolfgang Finishing Glaze 3.0 after Wolfgang Total Swirl Remover 3.0 to restore maximum gloss, especially on dark-colored vehicles. Then apply Wolfgang Deep Gloss Paint Sealant or Wolfgang Füzion Estate Wax to protect the newly polished paint. Wolfgang Finishing Glaze 3.0 combines the shine enhancement of a glaze with the light paint correction of a polish into one ultimate finishing product. For the maximum gloss, don’t apply wax until you’ve applied Wolfgang Finishing Glaze 3.0. Mist the Wolfgang German Polish N Wax Applicator with Wolfgang Instant Detail Spritz to moisten the foam. Apply a quarter size amount of Wolfgang Finishing Glaze 3.0 to the applicator. Note: Applying Wolfgang Finishing Glaze 3.0 by hand will enhance gloss but it will not remove swirls. 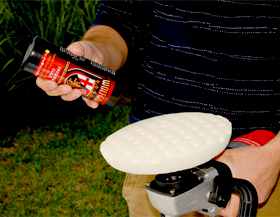 For paint correction, apply this product with a dual action or rotary (circular) polisher. Clean and dry the vehicle. Apply Wolfgang Finishing Glaze 3.0 out of direct sunlight. 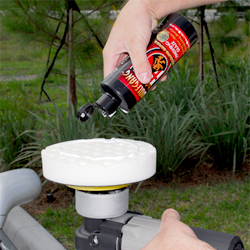 Use a soft foam finishing pad. Apply a bead of polish to the vehicle. With the polisher turned off, spread the polish over about a 2 x 2 sq. ft. area. Polish at 1000-1200 RPM (4 to 4.5 on a dual action polisher) working slowly across and then up and down the area. Check your work after several passes to see if the defects have been removed. If so, reduce the pressure and continue buffing until a high gloss is achieved. If the pad becomes dry, mist it with Wolfgang Instant Detail Spritz and continue buffing. Pour a bead of Wolfgang Finishing Glaze 3.0 onto a polishing pad. over a 2 x 2 sq. ft. section of paint. work side to side, then up and down. 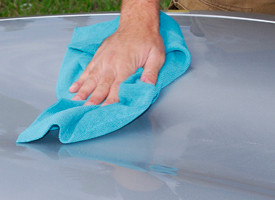 Buff away residue with a Microfiber Polishing Cloth. Wipe the polished area with a damp microfiber cloth. Always apply a wax or sealant after compounding or polishing. Wolfgang Deep Gloss Paint Sealant 3.0 seals in the shine with its long-lasting polymer formula. Wolfgang Füzion Estate Wax is a blend of carnauba wax and polymers that offers supreme protection with a traditional paste wax feel. You can also use a rotary polisher to apply Wolfgang Finishing Glaze 3.0. Set the max speed between 1200-1800 rpm.